Again, a long time i start to doesn’t have my time to type on this keyboard.. Less time of course, and too busy with works, night class and other things.. Really hoping that my night class will end sooner!! According to the Hindu people that i met here, they are celebrating the deity’s day… And this ceremony starts from morning till night time, where tonight is actually FULL MOON will appear.. 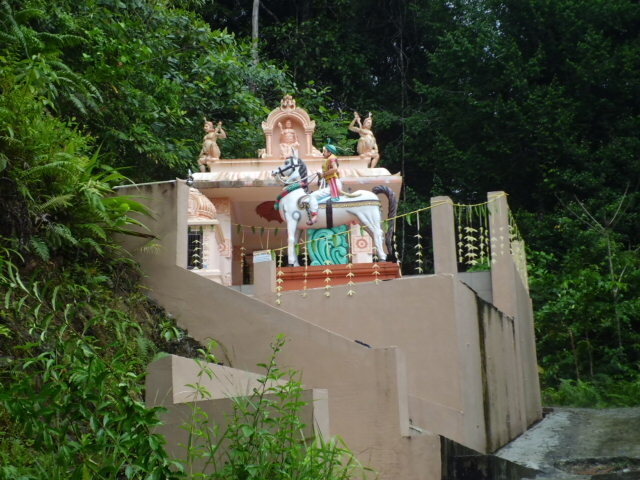 The history of the Hindu Temple in Mount Matang is interlinked directly with the arrival of the forefathers of the present day Indian of Sarawak. Though the artifacts of Hindu religious symbols at the Sarawak Museum indicate the presence of the community in Sarawak for a period exceeding a thousand years, the forefathers of the present day Sarawakians of origin owe their existence in Sarawak principally to South Indian and Sri Lankan tea and coffee plantation workers brought to Sarawak in the second half of the Nineteenth Century. According to official records, Indian convicts had been banished to work in Sarawak in the Mid-Nineteenth Century. The Matang Coffee Estate was opened by the Sarawak Government in 1867. The estate was managed on the lines of similar estates in Sri Lanka by a Superintendent, Mr. Anderson who had wide experience in managing estates in Sri Lanka. Tamil workers from Sri Lanka and South India were brought in from time to time. According to third generation survivors of persons born in Matang, 2,000 coolies were shipped to work in the estate from India and Sri Lanka. The early settlers were predominantly Hindu but found no place of worship. 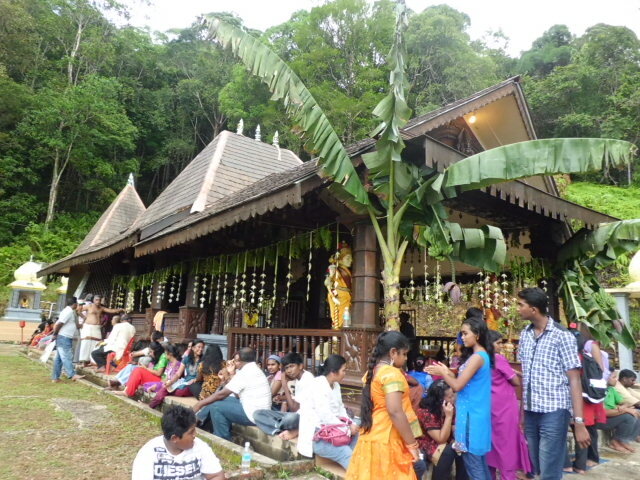 The settlers then got together and built the Sri Maha Mariamman Temple in the Coffee Estate. The records indicate that at that time, there were three sanitaria, one of which was the Matang Coffee Estate. The Rajah and Ranee have been recorded as staying in the Coffee Estate for about three weeks in 1870. Visitors to the Bungalow have described in glowing terms of the gentle gradient of the road contrived by the Superintendent to the Rajah’s Bungalow. “The Rajah’s garden is arranged on terraces cut in the slope of the hill; there the roses bloom magnificently and the jasmine attains a luxuriance I have not yet seen. All the different flowers we have in Sarawak seem to thrive remarkably well” describes the visitor. The Coffee Estate was supported by Coffee garden planted by three dayak villages of Sirambu, Bumbok and Peninjau situated about 300 feet below the Bungalow. By 1873, over 100,000 healthy plants were planted in the estate but the yield was “next to nothing”. By 1886, the Government Estate had diversified into tea and cinchona. The recruitment of Indian Labour was formalized by the establishment of the Indian Immigration Department in June 1897. The first batch under the Indian Immigration Agent arrived in June 1897. The Matang plantations were abandoned in 1912. The Indian labourers were given the option of either returning to their country of origin or accept alternate jobs mainly with the Public Works Department. According to an article by Saiee Driss in Sarawak Gazette (30 June, 1979), the Bidayuh Community in Matang was aware of the existence of the temple but they did not realise that the Hindus were scouting for the ruins of the temple. 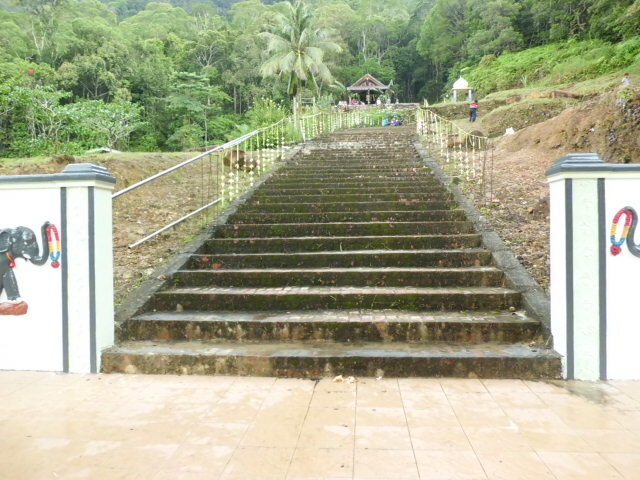 The temple’s location came to light when Abi bin Benggali, a Bidayuh/Melanau hunter had sought shelter in the temple in 1968 during a thunderstorm. He had taken an elephant statue home from the disused temple. He returned the statue the next day to the temple as the family members felt that the house was being subjected to a storm during the night. The news of this event spread to the Hindu residents in Matang. 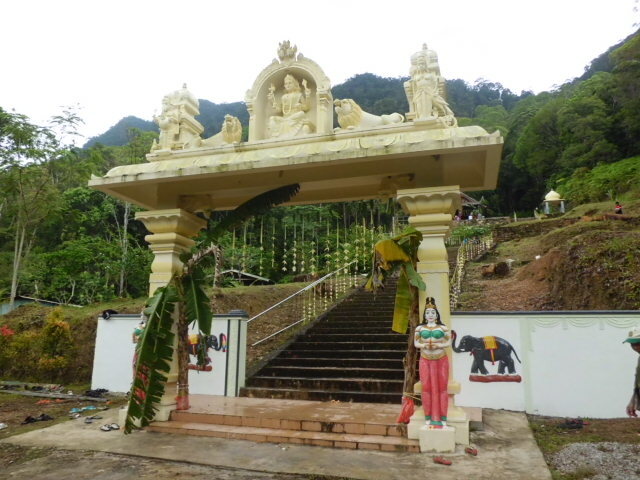 Soon, the Hindu Community renovated the dilapidated building overgrown with jungle trees and shrubs and cleared the pathway to the temple from the foothills. Now, just enjoy the photos that i and my hubby had taken on our journey with other participants..
learn how to identify the ironwood(belian tree)..
empili(local name) fruit, an important elements to survey of Orang Utan presence in a forest area, and their food too! !